I can feel Fall coming on. It’s August 22 and the heat index is probably 110 today. I can’t literally feel Fall coming on but I can feel a little excitement in the pit of my being that only comes with fall. – September issues of my magazines – that include things like fall recipes, autumn events and cool (temperature) looking scenes. – Now if we can get the temp to drop about 30 degrees it might start to feel like fall! Two of my favorite former students are engaged. 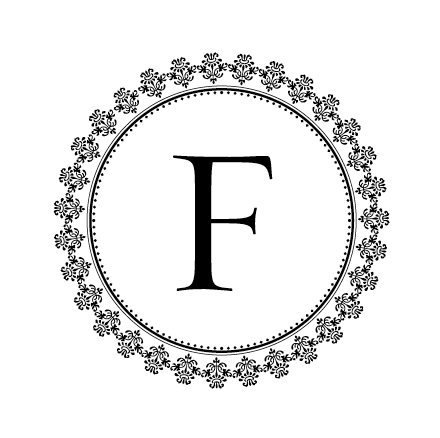 Best wishes to Stephanie and her upcoming November wedding to Fletcher. And best wishes to Charlotte and her upcoming January wedding to Ryan. I was honored to design the wedding invitation for Stephanie. 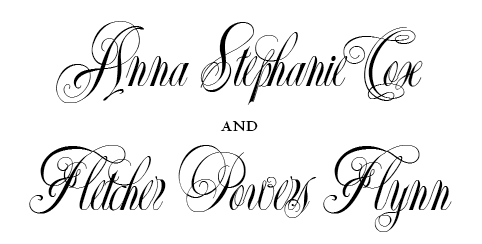 She chose a beautiful font and requested a monogram that would be only theirs. Just beautiful! They are currently in production and I can’t wait to see the finished product. A rich brown Pantone ink on Classic Crest – extra thick…stunning. And I’ve gotten the opportunity to do a little design for our women’s ministry at church also lately – pro bono of course. Lots of text…but I really enjoyed doing the paisley design. 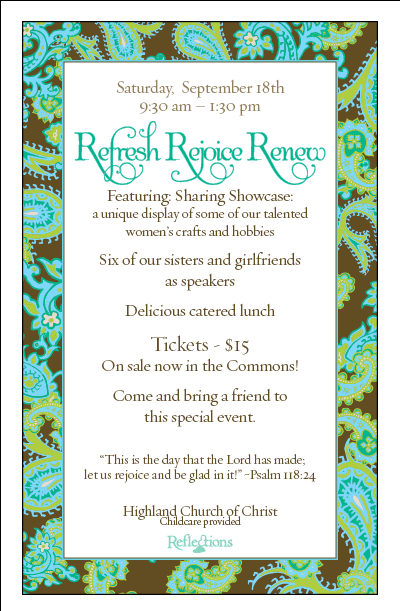 One of the parts of this ladies’ day is a Sharing Showcase. I’m looking forward to seeing what other Highland ladies have to share. I’m going to be sharing smocking. Fall also brings thoughts of October and holloween. 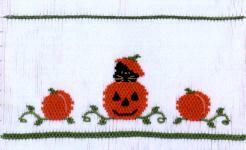 My latest sewing/smocking project for Garner is for October and is Little Memories Scare-D-Cat plate on a Children’s Corner Lucy. It will be modified Lucy with a yoke. The plan is to have a gingham or corduroy dress with the yoke. My friend, Vivian, who works at the smocking shop is making this with me. She’s ahead of me, but hopefully I’ll catch up this week. The picture smocking takes longer than geometric. This is my first yoke and picture plate. This will be a busy week…Highland’s Childrens Clothing Sale is this week and I’m working drop-off presale, and half price day. I’m hoping for a less busy week elsewhere. This time of year is always a little busy and I’m ready for things to settle out a bit. At church today I was a bit convicted on my prayer/study time. I was reminded that I needed to be intentional about my prayer time. Prayer with my husband. Prayer by myself. Prayer about our family, our jobs, and where God would have us. I pray that we will be intentional with our prayers and our time God has given us this week. Hey Woman – so good to see you in class this past Sunday. I missed seeing you in class. Love the invitation, pretty font. I too am excited for fall, I can’t wait for boots and sweaters and of course all of Lincoln’s first.